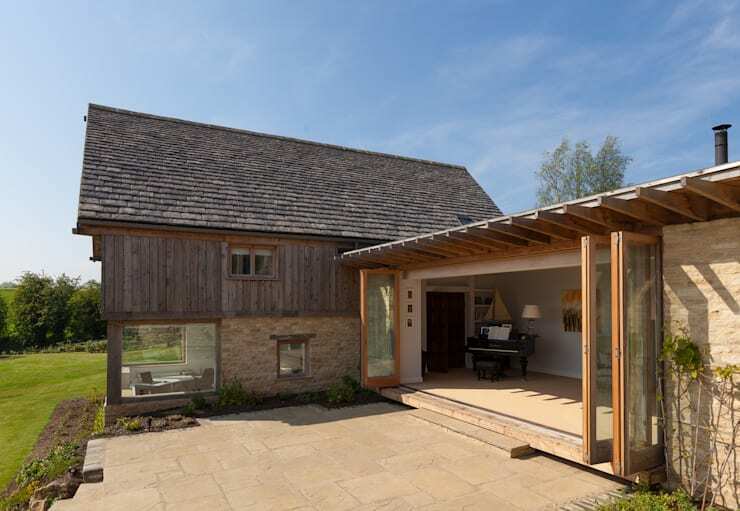 Today, we are going to visit Gloucestershire in the United Kingdom where architect professionals, Millar + Howard Workshop have built one of the most beautiful country homes that we have ever seen. Built on an expansive and impressive piece of property and making the most of natural and raw materials, this is a country home that is comfortable and modern, serving as the ideal getaway from the hustle and bustle of the city. While exploring this incredible home, we will learn tips and tricks for our own home, learning how we too can create a little haven out of our own homes. As we can see, this is a true country home, but it certainly is no cottage! It spreads over two storeys and across the large property, creating quite a visual impact. There is plenty of space in this home. We can also see that the country style merges with a more modern look and feel, thanks to the extensive use of glass and the contemporary design of the architecture itself. The large glass windows and doors also allow for a seamless transition between the interior and exterior spaces, which is simply beautiful! The garden plays as much role in the look and feel of the facade as the building, enhancing the natural and earthy look and feel. 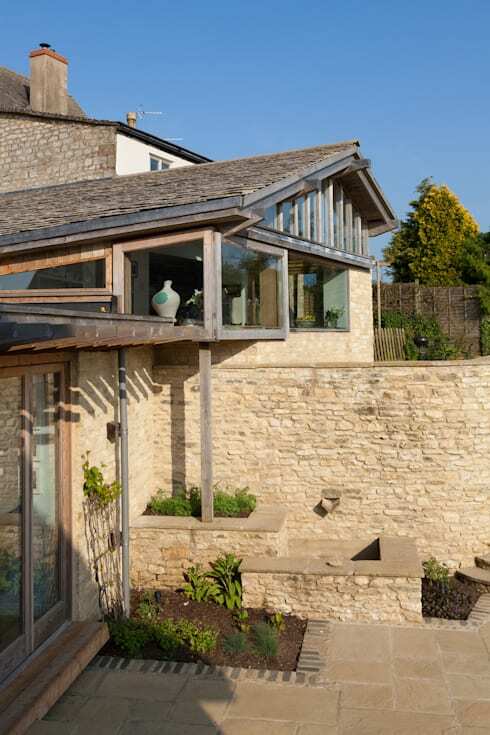 In this image, we can see how large glass doors fold back, opening the home up onto a gorgeous tiled terrace. This not only visually and physically expands the living area of the home, but it creates a beautiful outdoor area where the family can enjoy naps in the sunshine or dinners under the stars. Tiles are a great material for a terrace area. They look good but they are also very durable, lasting in all weather conditions. Paired with the perfect outdoor furniture and this is the ideal space! Have a look at these 7 ideas for the perfect terrace. We can also see how the designers have used different materials throughout the facade to create a very appealing look and feel. 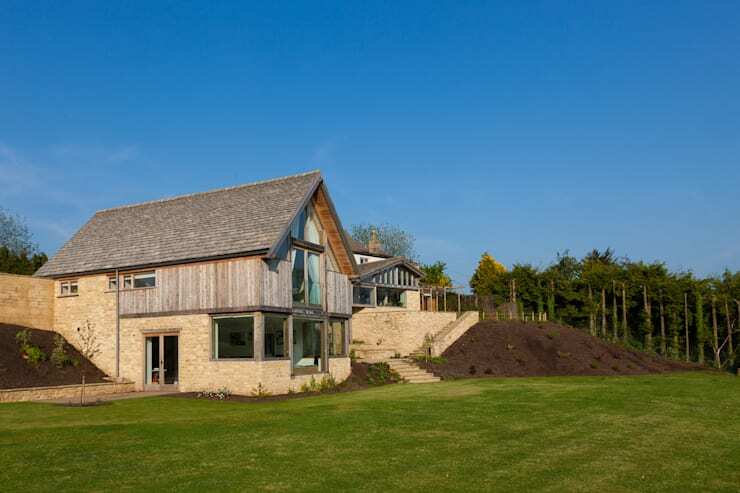 The stone cladding works in harmony with the wooden elements, resulting in a home that looks very impressive but also blends subtly into the surrounds. In this image, the glass windows used throughout the upper level of the house are revealed, showing us how the interior of the home has access to panoramic views of the rolling mountains and fields beyond the home. The designers have placed strategic flower beds and plants throughout the exterior space too, adding greenery to the design of the facade – the ultimate combination! 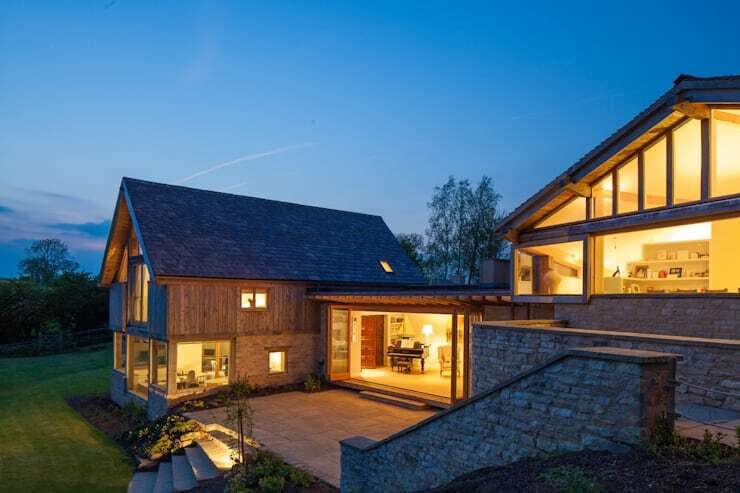 Remember that lighting plays a bit role in the design of a home, especially in the evening! In this image we can see how the interior lighting as well as strategically placed exterior lighting completely enhances the facade of the home, illuminating the intricate details. Lighting is key for ambiance, creating a beautiful soft glow that can make a home that much more appealing, warm and welcoming. If we zoom out, we can see the expansive property that this home rests on. The rolling fields and lawns create a wonderful and charming place for the family to play games, entertain friends and be one with nature. 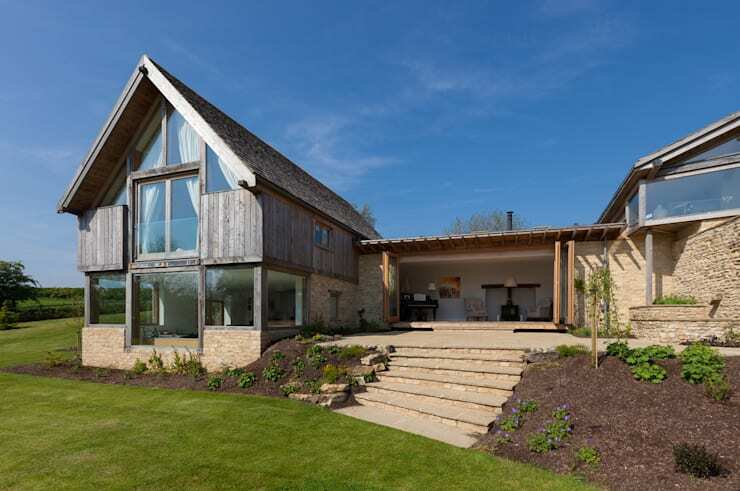 We can also see how impressive the country home looks in this image, set against a backdrop of greenery and blue skies. The wooden and stone facade is natural, earthy and homely while the glass introduces modernity and a more cutting-edge touch. This is a home that would truly allow for an escape from reality, without compromising on comfort or style.